We are a local nonprofit organization dedicated to supporting Lamorinda residents over the age of 55 who want to remain safely and independently in their homes. Please go to the Member Benefits page under the Membership tab for more detail on Village benefits and services. Are there other villages in Contra Costa? Yes! Walnut Creek Village and Clayton Valley Village launched in 2017. Find more information on this page. Where can I get more information about Lamorinda Village? Join our email list! If you wish to talk with someone for more information, please call 925-283-3500 or we will have the right person contact you. Membership costs $840 annually for individuals and $1,200 for a household. Social Membership costs $300 annually for individuals and $600 for a household. Memberships are for one year. 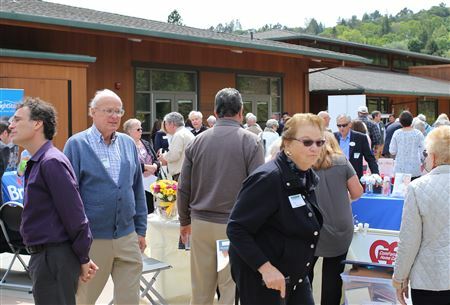 Social members, who pay half the fee of Members, receive all the benefits offered by Lamorinda Village, except volunteer services. Managing volunteers is the most time-consuming service provided by a Village, and so that's why the half-price membership excludes volunteer support. Social members may not need volunteer services until they are older or their circumstances change. However, since the Village is a one-stop concierge service, the Village office could refer a social member to make transportation arrangements on their own with other free or "for a fee" transportation providers, taxis, car services, or other non-emergency ambulance services with whom we may have arranged a discount for all our members.